A few months ago I was invited to join a friend at the The Governor’s House in Hyde Park, Vermont for a Sense and Sensibility Weekend, which is basically a weekend of Jane Austen-y activities at a historic house (built in 1895 but it’s a copy of a 1753 home), including tea, a dinner dance, and a sleigh ride! 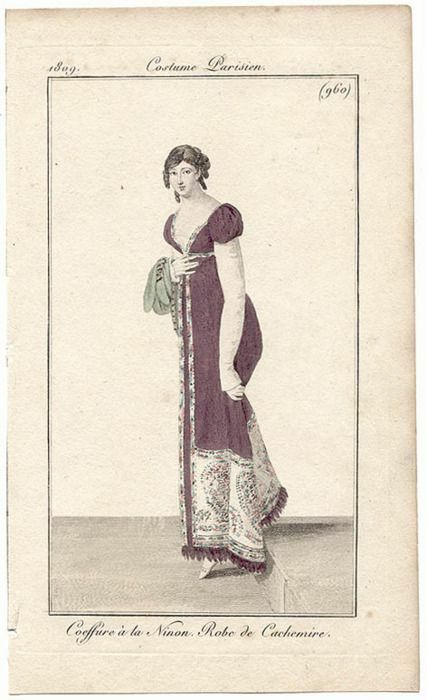 It sounded like fun, but I immediately knew that I would need to supplement my Regency wardrobe, which until now has consisted solely of evening gowns and springtime-appropriate daywear. Clearly, I needed something for winter! I wanted to use a more winter-appropriate fabric than my usual cotton, not only for warmth but also because I just thought something more textured would look better in the setting. The problem was, it was difficult to find lightweight wool in a pretty color at any price point, much less one that I was willing to pay. But then it occurred to me– what if I made my gown out of pashmina shawls? 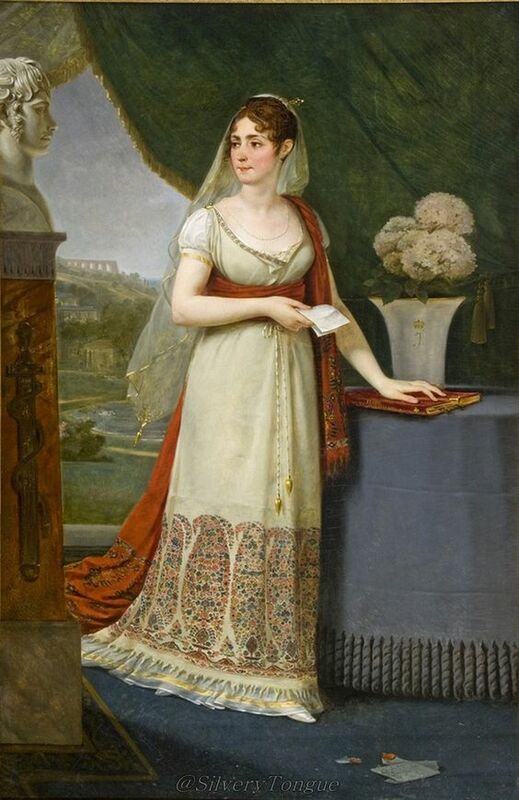 After all, making gowns out of such shawls is actually completely accurate to the period, as textiles from the Indian colonies were hugely popular during the Regency. Once I’d decided on my fabric I sketched out a basic dress– it has long sleeves (with a short puff at the top for interest), and like my cotton sari day dress it closes with drawstrings that gather the back section only. I’m going to modify my basic bodice so there are fan-shaped gathers in front, but they’ll be permanently set rather than on a drawstring.